You can adopt tasks from a project mind map. You can load tasks from a template. You can create tasks manually. You can also combine all of the three methods. You are in your InLoox project for which you want to create a new task. Click in the Ribbon on the Home tab on the Tasks button. Now, click in the Ribbon on the Edit tab on the New button. The new task will then be displayed in the left column of your Kanban board. You can now also edit the task in the editing side panel on the right. Name and description: Enter a name for your task and describe the scope of the task. Effort: Enter the estimated effort for the task. With a click on the little arrow, you can change the format from hours to working days (equals 8 hours by default). Resource: You can assign a resource to the task, but you don’t have to. In classic Kanban, team members choose the task that they want to work on next themselves from the To Do column. For a quick selection of frequently used resources, click on the little arrow, for the global address list, click on the three dots next to the resource field. Now select the person who is supposed to be in charge of the task. You can only enter one resource per task. Start/End: You can give you task a time frame, but you don’t have to. If you want to specify a certain start and/or end date, click on the arrow next to start or end and select a date and a time. When you add the task to an activity in the project schedule, the task will adopt the start and end date from this activity automatically. You are able to change that manually. Warning: In this case, we recommend to schedule the task within the time frame of the activity to which the task belongs. Documents: If certain documents are related to the task you can add them to the task by clicking on New link… in the documents section. You will get an overview of all project documents that have already been added to InLoox and for which you have a reading permission. If there aren’t any documents in your document library yet, you can upload a new document and add it to the task by clicking on New, selecting a document from your computer or from your file server and confirming with OK. Tip If you want to link a document to a project element but you have a large number of project documents, you can search for the respective document in the document list. To do this, simply click on the column above the respective column heading in the document dialog and enter the search term. 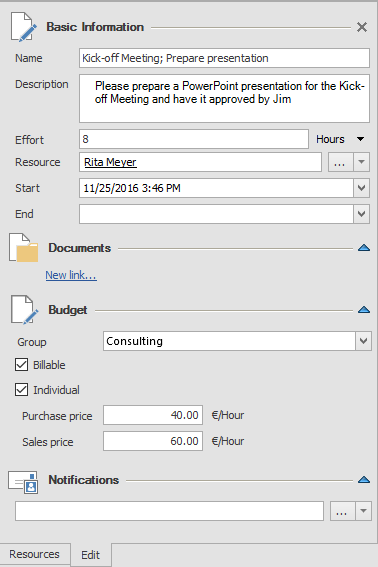 Budget: You can assign the task to a certain budget group. In InLoox, there is an internal price per hour stored for each budget group. This price is used if the task is assigned to a budget group. The InLoox Administrator can set the budget groups in the InLoox options. The Billable check box is activated by default. This means that for the hours of work that go into the task, a planned expense for the resource costs is created in the project budget. Later, you can generate an actual revenue in the project budget for this expense. If you remove the check, it is not possible to bill the expense later. Activate the Individual check box to ignore group rates and specify the purchase price and the sales price for the individual hourly costs of the resource. Notifications: The resource the task is assigned to receives a notification about the task automatically. In the notifications section, you can inform other people such as the project manager or a proxy about changes made to the task. Click on the little arrow to get a quick selection of frequently used resources or on the three dots to get to the global address book. The InLoox Administrator determines in the InLoox options if and when a resource gets notified. Don’t forget to save your new task. Click on the File tab in the upper left corner and then either on Save when you want to save the task, but want to keep working on the project or on Save and Close when you want to save the task and leave the project. You’ll also find your project-related task in the global project list where it is visible for anyone who has reading permissions for the task. You can edit an already existing task by double-clicking the task or, alternatively, by clicking on the Edit tab on the Edit button in the Ribbon. This will open the side panel that you already know from creating a new task. You can now change the task. Click on the speech balloon on the upper right corner to expand the task to read the description and the notes. You can add more notes in the expanded view. Click on the three Kanban cards in the upper right corner to get back to the standard Kanban board. If a task is done you can mark it and click on the Home tab on the Done button in the ribbon. You’ll find the same command in the context menu that you can open by right-clicking on the task, then select Done in the menu. 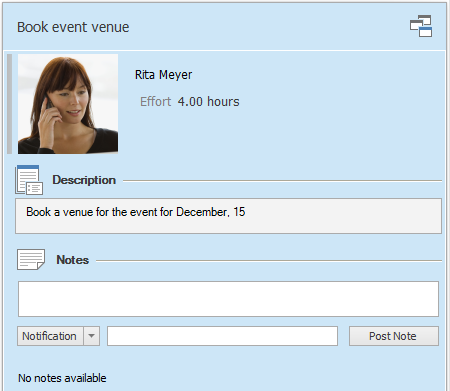 When a resource marks a task as done, all persons who have been added to the notifications field will be informed about it. The task will be moved automatically to the Done column / the outer right column of the Kanban board. The completed task will be reported back into the project plan and is included in the calculation of the project progress. If the project manager marks the task as done, the resource in charge of the task and all the people in the notifications field will be informed automatically about it. Tip When your project contains several similar tasks, you can copy tasks. Click on the task, then click on the Edit tab on the Copy button in the ribbon, then on the Paste button. Warning If the original version of the copied task contains constraints from an activity in the project schedule, these constraints won’t be adopted into the copied task. Start and end dates that were set manually, however, will be adopted into the copied task. 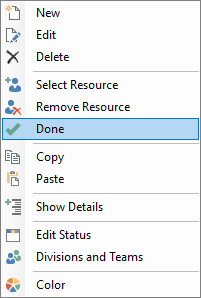 You can delete tasks by clicking on the task that you want to delete in the Kanban board, then on the Home tab on the Delete button in the Ribbon. You’ll also find this command in the context menu that you can open by right-clicking on the task that you want to delete. When you delete a task, the people for which you have set up notifications will be informed about it. If you are the manager of the project and you delete another resource’s task, the person will be also informed Deleted tasks are removed permanently, you cannot restore them. Tip When you want to delete several tasks at once, you can use multi-select. Keep the CTRL key on your keyboard pressed down while selecting the tasks that you want to delete with your mouse. Then select Delete in the ribbon. 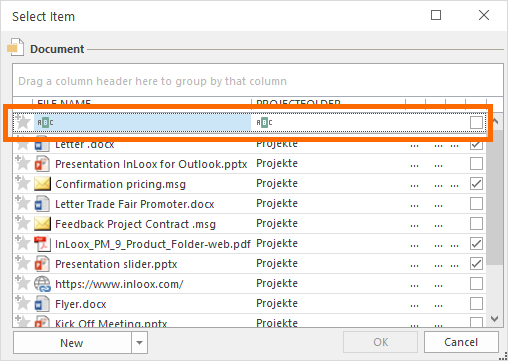 Create, edit and delete project tasks in InLoox 9 for Outlook • Copyright 1999-2019 © InLoox, Inc. All rights reserved.